In 2004 the 2.5 BMC Commander engine has been entirely overhauled by a professional and is very well running. A new diesel injection pump is then also installed. In 2014 a new waterpump. Repair manual and a set of bottom end set gaskets are on board. The entrance of the boat is in the center cockpit. Two steps down, on port side the steering, seating for 4 to 6. A bigger size second table is there to be able to receive more guests. The forward section of the boat, headroom of 1.80m, closes with a door, which makes it a private area. A third cabin with a double bed (currently used as a workshop/storage room but easy to re-convert) on port side. a toilet room with manual toilet and washbasin, headroom of 1.80m The forward cabin in a V form, headroom1.80m has two single beds, 1.72x0.40/1.00m. On starboard side lots of storage space, and a shower with a seat, headroom 1.78m. The aft section has on starboard side a practical galley, including a fridge with freezer compartment, two opening Windows and ample storage. The aft cabin, headroom of 1.78m has a double bed 1.96x1.40 m, a good size wasbasin in the cabin and two opening doors towards the aft deck. On starboard side opposite of the galley a toilet room, headroom 174m with washbasin. The roof of the center cocpit is canvas covered, held by wooden struts easy to fold away, exposing the cockpit area. Flotex carpet on the floor. Hot water comes from a calorifier, engine or 220 V. Two toilets, one electric and one manual. The engine is accessible by a central hatch, with a removable central beam for easier acces. The workshop/storage can be easily re-converted into the third double bed cabin. All is still there, including the mattress. Garmin GPS map 168 sounder/chartplotting receiver and depthfinder. VHF Lowrance LVR-250. Combined TV/DVD. 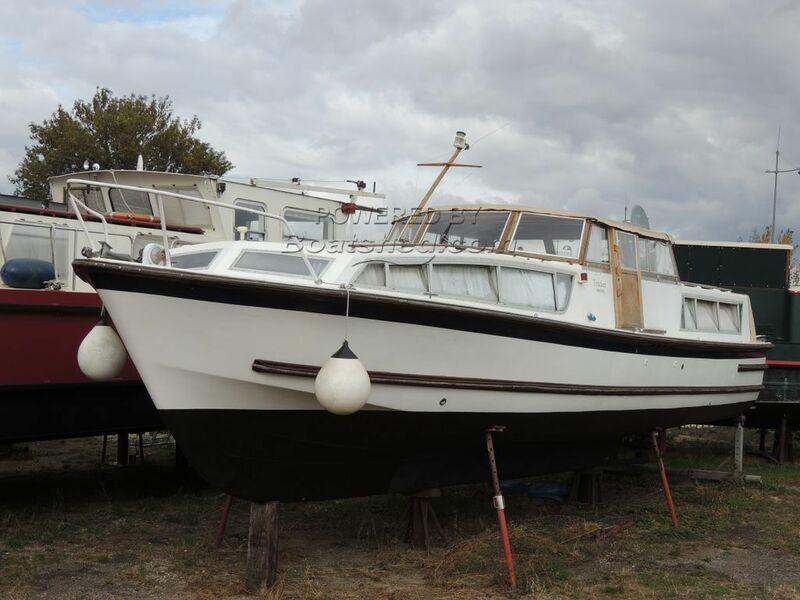 Ex hire boat for sale in France. Boatshed Bourgogne is pleased to offer this Norfolk Broads cruiser for sale in Burgundy. Built in 1973 by Jack Powels & CO LTD in England, only three of this type do exist. The current owners bought her in 2004 from the hire company. The owner, a professional carpenter, rebuilt the interior, cruised in England and brought her to France in 2009. Her draft of only 80 cm and air draft of 2,5 m allows to cruise almost everywhere on the inland waters. The hull is entirely repainted and all covers are new. This boat has been personally photographed and viewed by Cobie LAGERBURG of Boatshed Bourgogne. For further information and appointments to view, please call Cobie LAGERBURG, your Boatshed broker at Boatshed Bourgogne. This Broads Cruiser Type Center Cockpit has been personally photographed and viewed by Jacoba Lagerburg of Boatshed Bourgogne. Click here for contact details.